What was there - before Paddi ? Before Paddi was invented women had to wash cloth nappies / diapers. Before they became refined, nappies would have been just any old rags. Over time, they developed into thick white squares of absorbant cotton towelling -Terry Nappies. Often mothers would have a square of muslin (a thinner and softer material) which was put inside the Terry Nappy, to protect the baby's skin. Nappies / diapers were folded in a triangle, with the 3 corners brought up around the baby and fastened with a safety pin. If the baby had defaecated, the stool had to be wiped off into the loo. The nappy was then bleached to kill germs and then washed and then dried and even ironed by some. Until the advent of Paddi, the familiar landscape of urban Britain would be houses, with rows of white nappies flapping in the wind, to dry outside and bleach in the sun. This of course was in the days before washing machines and dryers when all washing was done by hand. Wool pants, or, once available, rubber pants, would sometimes be used over the cloth diaper to prevent leakage. Doctors believed that rubber pants were harmful because (they believed) the rubber acted as a poultice and damaged the skin of infants. The constant problem to be overcome was nappy rash, and the infection thereof. The concern was that lack of air circulation would worsen this condition. While lack of air circulation is a factor, it was later found that poor hygiene – inefficiently washed nappies and infrequent changes of nappies, along with allowing the baby to lie for prolonged periods of time with faecal matter in contact with the skin, were the main causes of these problems. The second world war caused a huge cultural change in Britain. It caused a change in women's role in society and it caused a change in the class system. Before the war, women did not as a general rule, go out to work. They stayed at home and looked after their husband, children and home. When most of the men went away to fight, women had to take on the men's work. They discovered that they could do it and quite enjoyed doing it and when the men returned, were sometimes quite loathe to relinquish their new positions. A change had happened that could not be reversed. However, if women were to work, they could not be chained to the kitchen sink washing nappies. The other big cultural change, was in the class system. Before the war, there were big houses, with upper class families looked after by servants. The 'Upstairs' and the 'Downstairs'. The war took away the 'Downstairs' and then - the 'Upstairs' had to learn to look after themselves! Before the war, upper and middle class women would have had servants to wash the nappies for them. Now they had to do it themselves. So here were two groups of women, who were extremely keen to find some system, that would mean they did not have to wash nappies / diapers. It would give them the freedom they needed to work or to travel, either on their, or with their children. Paddi - DID EXACTLY THIS. In the 1930s, Robinsons of Chesterfield had what were labeled "Destroyable Babies Napkins" listed in their catalogue for the wholesale market. In 1944, Hugo Drangel of the Swedish paper company Pauliström suggested a conceptual design which would entail the placing of sheets of paper tissue (cellulose wadding) inside the cloth diaper and rubber pants. However, cellulose wadding was rough against the skin and crumbled into balls when exposed to moisture. In 1947, a housewife in the UK named Valerie Hunter Gordon started developing and making Paddi, a 2-part system consisting of a disposable pad (made of cellulose wadding covered with cotton wool) worn inside an adjustable plastic garment with press-studs/snaps. Initially, she used old parachutes for the garment. She applied for the patent in April 1948, and it was granted for the UK in October 1949. In November 1949 Valerie Gordon signed a contract with Robinsons of Chesterfield who then went into full production. In 1950, Boots agreed to sell Paddi in all their branches. In 1951 the Paddi patent was granted for the USA and worldwide. Shortly after that, Playtex and several other large international companies tried unsuccessfully to buy out Paddi from Robinsons. 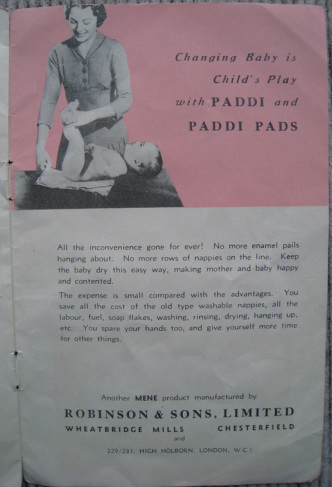 Paddi was very successful for many years until the advent of 'all in one' diapers. Marion Donovan used a shower curtain from her bathroom to create the "Boater", a plastic cover to be donned outside a cloth diaper. Although she made her first in 1946 they were first sold in 1949 at Saks Fifth Avenue's flagship store in New York City. Patents were later issued in 1951 to Donovan, who later sold the rights to the waterproof diaper for $1 million. Donovan also designed a paper disposable diaper, but was unsuccessful in marketing it.